Deluxe acrylic angled sign frame display presents your promotional message at the perfect viewing angle when used on a counter or table. Easy side loading for fast and easy changes, and a professional look essential for communicating quality and importance. Slant-back table frames are simple one-piece ad-holders made of premium acrylic with smooth frosted edges. 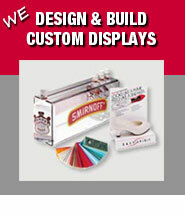 Great as a countertop table frame, sign holder, photo frame or as a restaurant display for menus and price lists. 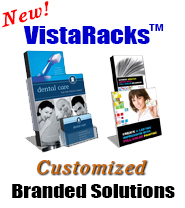 Can be combined with a take-one rack card pocket or business card pocket for added versatility and message impact. Available in either vertical (portrait) or horizontal (landscape). Overall sign holder dimensions: (Vertical) 8-1/2 inches wide x 11 inches high x 5 inches deep. Overall sign holder dimensions: (Horizontal) 11 inches wide x 8-1/2 inches high x 5 inches deep. Attach this display to virtually any flat surface. Includes permanent mounting tape. Slantback Sign Holders 3.5" x 5"
Slantback Sign Holders 2-1/2"x 3-1/2"